You may have a viable product but do you have a viable business? (Also posted on LinkedIn here). I’m a big fan of the “Lean startup” movement. Steve Blank, Ash Maurya and others have done amazing work around innovative, startup companies. Two of my most recommended books in this area are The 4 Steps to Epiphany and Running Lean. I strongly recommend every founder read these. Shockingly, most haven’t! I’ve come across a new breed of founders who are well versed in the lean startup methodology. They understand the importance of customer discovery, a minimum viable product and the power of testing. These are all necessary to build new products. I submit that they are not sufficient to create a company. A feature isn’t a product; a product isn’t a business; a business isn’t a company; a company isn’t an organisation. Here are four additional questions you need to look into before you startup. 1) Are you talking to the right, representative prospects to validate your idea? I’m a big believer of getting out in the field and talking to customers. Dozens even 100’s of them. It is an order of magnitude better than sitting in your office and pontificating. However, talking to 200 people does not make your idea into a viable business opportunity. Are these 200 people truly representative of the prospective customer pool ? Or, is there a selection bias? Perhaps, these are only tech-savvy customers in urban areas or the upwardly mobile. You need to estimate how big is that addressable market over the couple of years. Secondly, how critical of a pain point is it for these users? Is it an ongoing pain or a one an infrequent, perhaps even a one time, problem ? In general technology has made people be more open to saying “yes” more often to new ideas. This is the classic Aspirin vs. Multi-Vitamin question that VCs often talk about. While new ideas area interesting, it often takes years to change customer behaviour unless it a dire problem for a large number of prospective customers. Don’t try to “invent” demand. Find basic human needs and solve them better, cheaper and faster. Evan Williams, Co-founder of Twitter. Market creation is hard for a variety of reasons; one of the primary reasons is that the cost of distribution is continually getting more expensive. Lastly, would customers pay — ideally with money or at least with their time(e.g. Snapchat, Instagram, Google)? 2) Can you get effective distribution of your product or service ? Human beings and businesses alike are being bombarded with a breathtaking innovations at a rapid pace. However, the amount of time, energy and money they have is limited. How will you reach a large number of customers whether they be consumers or businesses? Are there existing channels that you can tap into ? Would they be cost effective? Every innovator believes that their product will have strong word of mouth, virality and/or some kind of network effects? Well, most don’t. For most ideas, esp. in B2C, I would be very dubious if you don’t have strong, organic user acquisition channels to grow. 3) Are the unit economics viable? So you have a problem worth solving, a solution that’s differentiated and a shot at distribution. Now comes the question about “Unit economics”. The simplest place to start is with your gross and net margin. How much money would you make per transaction (or unit of engagement)? This is not GMV or Transaction Value but the money that your business makes. The first step for this is to calculate your Contribution Margin, or the money you make per transaction less your variable costs. For most businesses, variable costs are marketing, payment gateway charges, delivery/logistics charges, etc. This does not account for fixed charges for your employees, server costs, etc. Is your margin or take rate (%) enough to cover your variable costs per unit? If you are relying on scale to get your contribution margin positive, you are barking up the wrong tree! You may never get there. 4) Is there a large enough profit pool to tap into? If you’ve gotten this far, you clearly have a problem, distribution channel and business that’s worthwhile. Is there a large enough market size and profit pool in the area that you are in? If you don’t have a large enough profit pool, you may build a company with great unit economics on a large enough market but have little discounted future cash flow (e.g. IRCTC — Indian Railways). See Rajan Anandan’s prescient comments on the Indian B2C e-commerce marketplaces. Now comes the source of capital to build your business. If you are aiming for something big and ready to scale fast, then I would recommend using venture capital (if you can affirmatively answer all 4 of these questions, give us a shout at Prime Venture Partners). However, VC money may not be appropriate or relevant for your business or your approach. Here’s one representative list of questions to ask yourself before raising VC money. All of this won’t be empirically figured out on Day 0 of a startup. Of course, you will learn along the journey. However, you won’t be able to change the contours of the market or the availability of profit pools once you are 6–12 months into your startup. It behooves you to spend a few weeks or even months to think through these questions before you commit yourself to a new company! Guest Post by Amit Somani. He is a Managing Partner at Prime Venture Partners, an early stage VC firm based out of Bangalore, India. Prime invests in category creating, early stage companies founded by rock star teams. Prior, Amit has held leadership positions at Makemytrip, Google and IBM. He is also deeply engaged with the early stage startup ecosystem in India and actively volunteers with iSpirt, TiE and NASSCOM. He tweets occassionally @amitsomani and is trying to become an active, late blooming blogger. 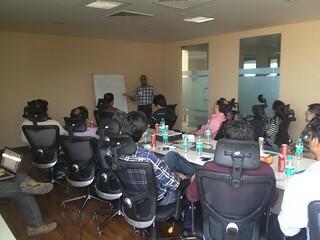 Product management is one of the most common sensical and yet least understood areas in the Indian technology industry. What is product management? When do you need it? Is it important only once you have reached product/market fit and are ready to scale? What are the metrics that every product manager should care about? How should you hire PMs? Amit Somani & Rahul Kulkarni will host a highly interactive Product Management Roundtable for Startups to address these questions and more. While most of the examples will be from from B2C products but the discussion should be broadly applicable to other areas as well. Apply for the PlaybookRT here. Amit comes with over 19 years of experience in the technology and internet industry. Currently, Amit is an Entrepreneur in his residence and also actively investing in, and mentoring startups. Earlier, he was the Chief Products Officer for MakeMyTrip. Prior, Amit has headed various search, mobile and ads products at Google and was the Director for the Enterprise Search and Discovery business at IBM based out of San Jose, California. Amit holds a Bachelor’s in Technology degree in Computer Science and Engineering from Indian Institute of Technology – Banaras Hindu University, India (Gold Medalist) and an M.S. degree in Computer Science from the University of Wisconsin, Madison. He has published several papers and holds seven US patents. More about Amit on Twitter, LinkedIn. Rahul Kulkarni is the Chief Product Officer at Sokrati, a digital marketing and analytics startup thats driving the convergence of big data analytics, consumer psychology and ad technology. Before jumping into the startup world, Rahul spent close to six years at Google – starting out as Google’s first product manager in India and managing various products such as Google Maps and Local, cloud computing, Orkut and Google Finance. Prior to Google, Rahul was the Product Manager for LabVIEW at National Instruments Corp in Austin, TX where for five years he led new product development of high speed control systems used in diverse applications – from offshore drilling to space exploration. Rahul holds 8 patents, Masters degree in Engineering from Georgia Tech Atlanta and Bachelors in Engineering from VJTI Mumbai. 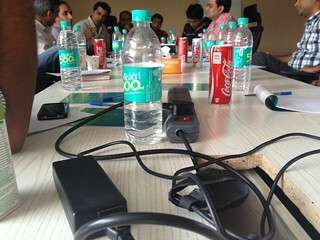 The Product Management Playbook roundtable repeated last week with an intent to check progress. The mentors – Amit Ranjan & Amit Somani were keen to know the problems product managers faced while they executed on ideas discussed in the previous episode. We could guess this would be one power packed session, especially from the conversations that ensued over lunch. There were active discussions, funny anecdotes and heartfelt laughter which filled the Eko cafeteria. New bonds were built and older ones renewed as we savored the delicious dishes. 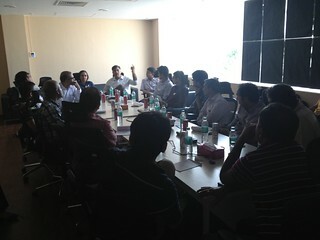 The RoundTable was started with Vikram Bahl of Yavvy.com presenting his product management approach. Presenting a meticulously planned mind-map, his presentation discussed the challenges, the solutions and their outcomes. Elements from the previous round-table were clearly visible. “All of our metrics have now been divided into 1/1/1 (1 day/1 week/1 month)”, he told picking up on the 1/1/1 metric philosophy suggested by Amit Somani of MakeMyTrip in the previous round-table. He also mentioned that the “email-suggestion” and “leveraging-existing-paradigm” suggestions by Amit Ranjan (of Slideshare) had done them loads of good and the results were very encouraging. 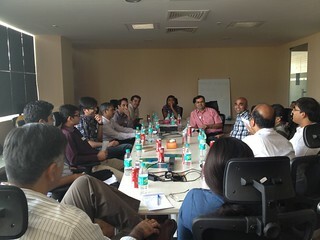 “This time, I got advice on stuff that goes beyond traditional product management, it was more around positioning and marketing”, said Vikram as he reflected upon the discussions. Next, Bishal Lachhiramka of Drishti soft spoke about his own product management approach. Touching upon organisational structure, product manager roles and global benchmarks, this was another amazing discussion. Participants shared their own experiences and what has worked for them and what hasn’t. Tarun Matta of IIMJobs also got some amazing feedback on some of the things they intent to do. Picking up on the experience in the room, he picked up on strategy and executive advice on what could propel IIMjobs onto the next orbit of growth. We also had Shantanu Mathur introducing ‘Smartwards’ and Mayank Dhingra of Paytm bouncing off ideas on how to build product-management metrics for online products. 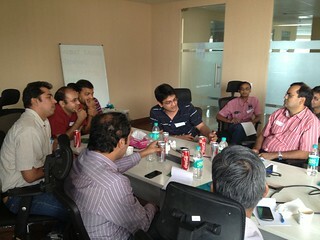 Even though, this was their first round-table, they found themselves brought upto speed by the mentors. The final few minutes of the day were spent discussing “how to divide and structure roles and responsibilities of different program managers”. Avinash Agarwal and Abhishek Sinha of Eko, presented a delightful case-study which helped sum up the discussion. Doesn’t that sum up what these round-tables are all about. Participate in the next one to find out! 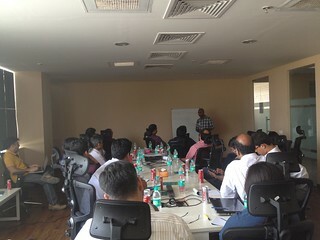 Avinash Raghava, who is doing a wonderful job of getting product start-ups together all over India, organized a product management roundtable with the help of Aneesh Reddy(CEO, Capillary). They invited Amit Ranjan (Cofounder, Slideshare – acquired by LinkedIn) and Amit Somani (Chief Product Officer, Makemytrip, ex-Google) to share their insights with a small set of entrepreneurs. Credit for all the good stuff goes to Amit Ranjan, Amit Somani and Aneesh Reddy. Notes are rough. If anything is unclear, feel free to comment. Who would make a good product manager? Best way to find a product manager in India is to find someone who did a startup but failed – he/she is likely to know all the various aspects that go into managing a product. Someone who can lead by influence and manage to juggle all the balls in the air. Should be someone who can say NO. It’s a very tough position to hire for – you need to have patience – you might go wrong the first few times. Once hired, give them around 5-6 months to get the hang of the whole thing. What does a product manager do? What is his role about? A good product manager would understand the requirements from various constituents and write a detailed specification, plan for bugs, testing, urgent requests and then create a product roadmap/deadlines. A product manager has to identify and write down what metrics will move once the product is launched (e.g launching the mobile app will increase our repeat orders by 9%) – in some cases it is just to ensure that people work on things that matter but overtime it also brings more accountability. User specs should have – what all do you need, who will use it and why – need to be elaborate it before you give it – need a hypothesis that will it move an X metric. Read thetwo page spec document that Joel Spolsky wrote for a fictional website What time is it? It should also have non-goals – what the product does NOT try to do. Engineers tend to underestimate the time it’ll take – product manager needs to be able to correctly estimate how long something should take. And you will get better at it with time. Use the 1/1/1 rule – sit with the engineering team and plan what needs to be accomplished in 1 week, 1 month and 1 six-month period. You need to hire coders who have a design sense (that eliminates 70% of work later). Role of special data or analytics person has become very important (Amit Ranjan said that he could see that products of the future will be decided and influenced by data scientists). It is very important to get such a person on board early. Someone who has crunched SQL and nosql logs etc and can find trends and look up aberrations. Read up on Hal Varian and DJ Patil to understand more about this. Difference between customer requirements and product requirements – customer requirement only becomes product requirement when more than 3 people require it (it’s a rule of thumb) – (People shared various tricks they use to ensure that the customer requirement is serious – “just wait for a few days and see if they come back with the same request”, “ask them to email it and not take feedback over the phone” etc. – these are situations where there is too much feedback coming your way. In most cases, it is best to make it as easy as possible for people to give you feedback). Keep product engineering teams small – Amit Somani mentioned Jeff Bezos Two Pizza rule i.e. if the team cannot be fed by two pizzas alone, it is too big. Read more here. Everything is a 6 page document – another Jeff Bezos funda for getting clarity. 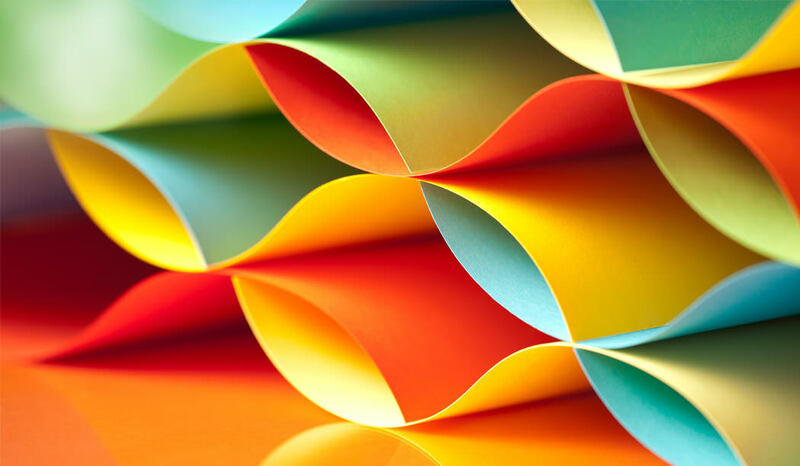 So a specification or a product request could be a 6 page long form document which ensures that the person achieves clarity before building anything. You need to benchmark your product against other products especially in enterprise. When starting a product from scratch this can be a really useful exercise. Amit Somani suggested a mental trick – before building a product, write a one page press release for the product that comes out upon product launch – what will this press release have? What the key features? The target audience etc. This PR drafting exercise could help you decide what to build, what is critical, and for which audience. Track at your mobile traffic – people at the roundtable reported some crazy growth numbers for mobile internet usage – huge sites are now getting 20% to 60% of their traffic on mobile. Mobile traffic is split 50%-50% on mobile browser (including WAP) and mobile apps. This was a big eye opener for many people. Use Morae for recording users’ reactions when they are using your product ((Amit Somani mentioned how they put a live usage recording on a LCD screen in the technology room so that engineers could understand how their products were being used – it lead to a lot “can’t he just click on the button! Why is he scrolling up and down!”). One way to get users for such recordings is to ask interview candidates who come to your office to use your product and see their reactions. Use a call-outs software when introducing new product features (like Cleartrip / WordPress / Facebook do). This was one of the most gyan-heavy sessions that I’ve attended. It was useful to hear things from people who had been there done that. Aneesh (even though he is based out of Bangalore) had taken the lead to do this with Avinash and our hope is that the group meets every 6 weeks to keep the conversation going. We’ll keep you posted. Feel free to email me at ankur AT Akosha dot com if you’d like me to give more details to you. On a related note, there was some basic debate about what a “product” is. We didn’t get into it at length because everyone in the room intuitively understood what a “product” was. However, we had internally debated about it – if you are interested, do read –Understanding Product v. Service [ThinkLabs Notes 1].